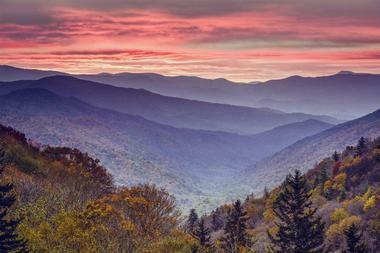 Gatlinburg is a thriving town set in a valley of the Great Smoky Mountains. Picturesque and historic, it is a common stopping point for travelers in the Eastern United States, and is an ideal base for exploring Great Smoky Mountains National Park. 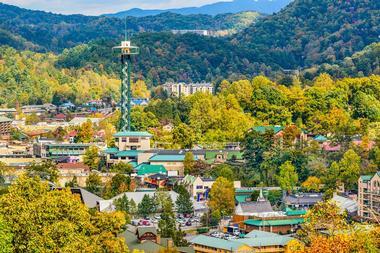 Gatlinburg, Tennessee has a wealth of hotels, motels, cabins, restaurants, shopping, and tourist attractions, with an emphasis on family fun and outdoor activities in the Great Smoky Mountains. Great Smoky Mountains National Park is the country's most visited national park - for its ancient mountains, diversity of animal and plant life, and remains of Southern Appalachian mountain culture. Highlights include: Cades Cove, wildflowers, and hiking. 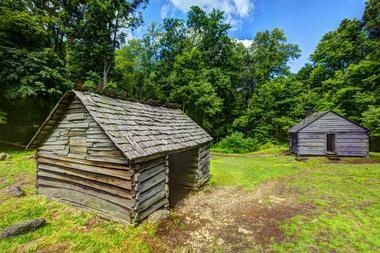 Cades Cove is a valley encircled by mountains. A one-way loop road takes visitors through the cove for 11 miles. On Wednesday and Saturday until 10 AM from early May to late September only bicycle and foot traffic are allowed on the loop road, otherwise, cars are permitted. White-tailed deer, black bear, and coyotes, among other animals, can be seen in the area. The park boasts 1,500+ flowering plants, more than in any national park in North America. Flowers bloom all year long. Hiking can be enjoyed all year long, as well. 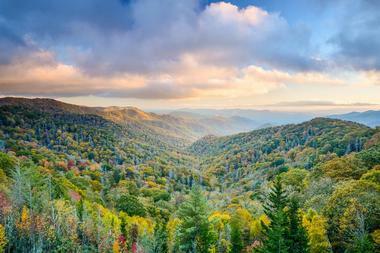 Some of the most popular hikes are Charlies Bunion, Alum Cave Bluffs, Andrews Bald, Rainbow Falls, and Chimney Tops. The Gatlinburg Scenic Overlook is a pull-over spot on the Gatlinburg Bypass with astonishingly beautiful views of Gatlinburg itself, and of the Great Smoky Mountains that surround it. The majestic mountain and valley views that the overlook affords makes it a popular place for photographers and for locals and visitors who come to view the stunning sunsets. Lucky visitors may see bears and wild turkeys in the nearby landscape or in the parking lot itself. The Gatlinburg Scenic Overlook is a 15-30 minute drive from central Gatlinburg, depending on traffic, and is a free attraction. The Gatlinburg Skylift has been transporting tourists up the side of Crockett Mountain since the 1950s. Built to resemble a ski-lift, this ride takes five to six minutes to climb the 1,800 foot mountain, and offers a rest area, refreshments, and a small gift shop at the observation area up top. Visitors get a chance to slow down and really enjoy the beauty of the Great Smoky Mountains; its blue hills, cloud-topped peaks, blue-green forests, and cold-water rivers. 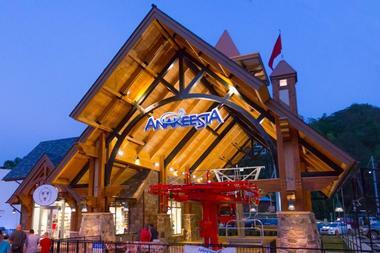 Evening visitors can enjoy the Skylift as well, and have a chance to see Gatlinburg illuminated in the valley below. The Gatlinburg Space Needle is an observation tower overlooking Gatlinburg and the Great Smoky Mountains. Visitors are taken up to the observation deck in two glass elevators. On the observation deck visitors can use viewfinders at no cost, and are treated to educational exhibits that provide valuable information about Gatlinburg and the Great Smokes. At the base of the Space Needle, locals and visitors alike come to enjoy Arcadia, a two-story, 25,000 square foot arcade, to which new games are added regularly. Arcadia contains The Slice Pizza Bakery, a delicious place to dine on pizza, calzones, salads, and appetizers. Also at the base of the Space Needle is the Iris Theater, which is a hotspot for the best and most entertaining live comedy shows. Gatlinburg Space Needle is one of the top Gatlinburg attractions. 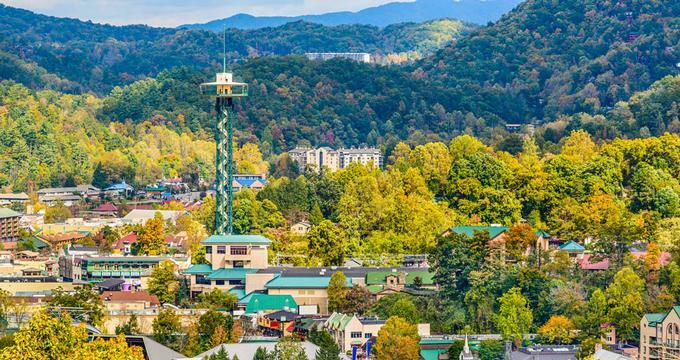 See the sights in and around Gatlinburg from a unique position - aboard a trolley, which you can catch at more than 100 locations. The city's trolley car routes are color-coded. Check out the signs on the sides and front of every trolley to confirm which route you want to take. The routes are as follows: Downtown River Rd., Red Route; Downtown Parkway, Green Route; Arts & Crafts Community, Yellow Route; National Park, Tan Route; Dollywood, Pink Route; East Parkway and City Hall, Blue Route; North Gatlinburg Parkway and Welcome Center, Purple Route. Fares range from 50 cents to $2. The city runs 20 trolleys that service a 50 mile-area. Visitors may climb on the Gatlinburg Trolley and ride for unlimited rides for $2.00 a day, excluding the tan and pink routes. You may buy a Trolley Pass at certain Gatlinburg lodging facilities, City Hall, and the two Welcome Centers. Ripley's Believe it or Not houses an Odditorium full of artifacts both bizarre and unusual; many of the exhibits are interactive. In addition to their traditional museum, the Gatlinburg Ripley's also has a labyrinth of mirrors, a 3D theater in which the seats move along with the action, two miniature golf courses, and a haunted house peopled with live actors to add to the creepiness and thrills. Ripley's Aquarium of the Smokies is filled with a large display of sharks, a pool where visitors can pet bat rays, and a penguin exhibit with see-through glass tunnels allowing visitors to watch the activities of the penguins as if immersed in the water themselves. 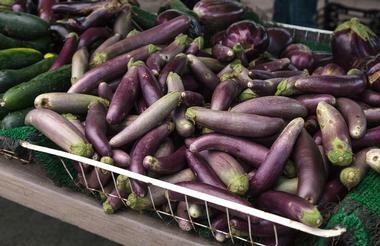 The market, currently in its seventh season, offers Tennessee-grown produce, foods, and local products. Customers will find a variety of seasonal products that may include nuts, fruits, berries, jellies and jams, honey, and vegetables. Baked treats, plants, and natural health and wellness products are also available, but that's not all. Every second Saturday, the market offers special events and music. Children can look forward to participating in activities every fourth Saturday, plus a scavenger hunt. 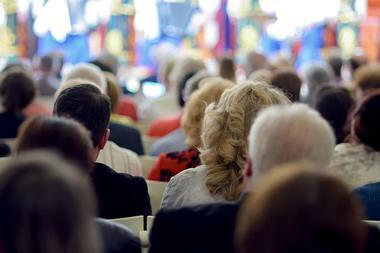 The "Market Calendar" tab on the market's website provides information about upcoming events. The market is all about enhancing the quality of people's lives and making everyone aware of the economic, nutritional, and environmental implications of purchasing local, seasonal products, so the market has created internship opportunities for young adults. The "Internship Opportunities" tab on the website has details. 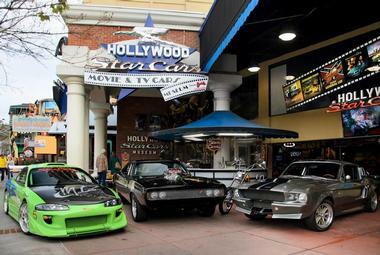 The Hollywood Star Cars Museum houses forty cars from Hollywood movies and TV shows. On the hour-long tour of this exciting museum, visitors have the opportunity to view the jalopy from The Beverly Hillbillies, two Batmobiles - one from the original TV show, and one from "Batman Returns", - the Ghostbusters Ecto-1 van, the DeLorean made famous in Back to the Future, and the General Lee from The Dukes of Hazzard. Recent acquisitions include cars from The Fast and the Furious movies, Paul McCartney's Cadillac, and the 1955 Thunderbird that belonged to The Beach Boys. The museum has a gift shop, and offers visitors a chance to pose for commemorative photos in cars from the museum's collection. 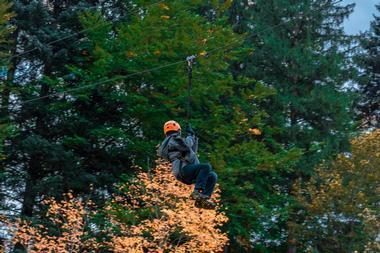 CLIMB Works Smoky Mountains is a two and a half hour zip-line adventure that will be appreciated by all adventurers. Created by zip-lining professionals with the highest of safety standards, this canopy tour allows its guests treetop views of the beautiful Great Smoky Mountains National Park. Zip-lining tours begin with an ATV ride to the top of the mountain, followed by nine world-class zip-lines and three sky bridges. Visitors can look down at trees, streams, ravines, and wildlife while traveling from one tree to the next. Water is provided along the route, and novices are welcomed and taught the basics of the sport. Sunset tours are available in the summer months. 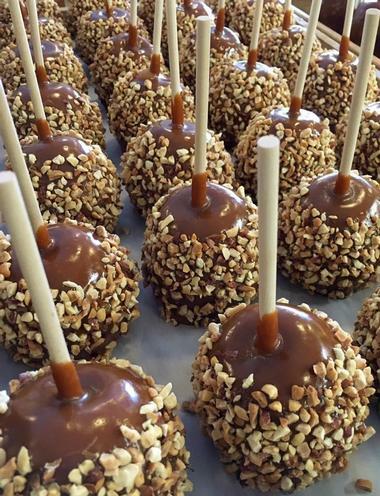 Visitors to Gatlinburg with a sweet tooth need go no further than one of the Ole Smoky Candy Kitchen's two locations. The stores were founded by Dave and Peggy Dych, a young couple headed to California to seek their fortune. 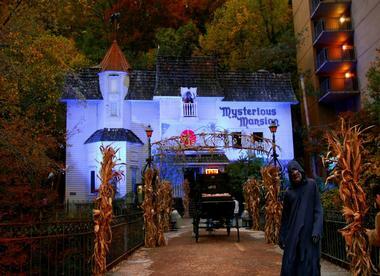 Gatlinburg Mysterious Mansion is a Victorian-era three-story home that offers the best thrills and the most scares in town. Kids and adults alike will love the secret passageways, the excellent and frightening live actors, the flickering lights, and the authentic Victorian details. Skeletons, corpses, cobwebs, and freaky costumed actors are around every corner, and in every mirror there are ghostly faces. To add to the fun, guests must find their way out of the house in complete darkness. The Mysterious Mansion has been family owned and operated since 1980, and is regularly renovated to add to the décor and the chilling atmosphere. Close to downtown Gatlinburg, the Gatlinburg Trail is one of only two in Great Smoky Mountains National Park that allows bicycles and dogs. The 3.8-mile-long loop starts and ends at the Sugarlands Visitor Center, band is an easy, level trail and suitable for visitors at all fitness levels. The trail runs along the Little Pigeon River, and pedestrian foot bridges allow trail walkers to cross back and forth from one bank to the other. Beautiful views, waterfalls, and the foundations and chimneys of old homesteads are visible from the trail, and there is an old cemetery that will please the historically-minded visitor. 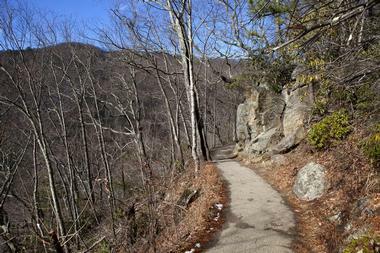 The trail is cool, shaded, and peaceful, and is a welcome respite from the hustle and bustle of downtown Gatlinburg. In 1802, William Ogle of South Carolina journeyed through Eastern Tennessee and found a place so idyllic that he called it "paradise." He cleared some land and hewed logs to build a cabin for his family. Shortly after he returned to his home, he died of malaria. His wife heeded his wishes to take the children to the area he called White Oak Flats, and in 1809 she built the cabin out of the lumber her late husband had provided. Martha Jane Huskey Ogle was the first settler of what is now Gatlinburg. Her family lived in the cabin until 1910, and the cabin and the Ogle family barn still stand and are a popular tourist stop, and an ever-present memorial of the strong and hardy settlers of Appalachia. 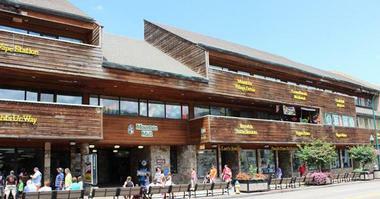 Ober Gatlinburg has so much mountaintop fun to offer visitors and locals. Getting to the peak in an enclosed tram car is part of the fun, and there are many ways to enjoy the descent even more. The Ski Mountain Coaster is a family-friendly ride that takes five and a half minutes, and travels over a mile. There are two alpine slides 1800 feet in length that travel through the woods to the mountain's base. Visitors young and old can play mini golf, get lost in a maze, try out chair swings, ride an indoor carousel, or let the kids run around a kiddie playground. 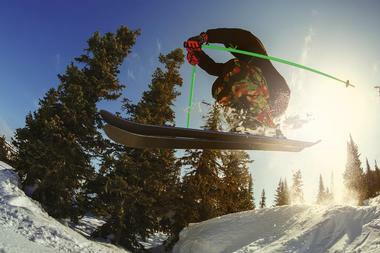 In the winter, skiing and snow tubing are available, in addition to ski rental equipment and lessons for all ages. The Salt & Pepper Shaker Museum has humble origins. A couple in Texas went looking for a pepper mill, and were entertained at the variety of salt and pepper shakers available. They started a collection, which grew rapidly, and it needed a home. 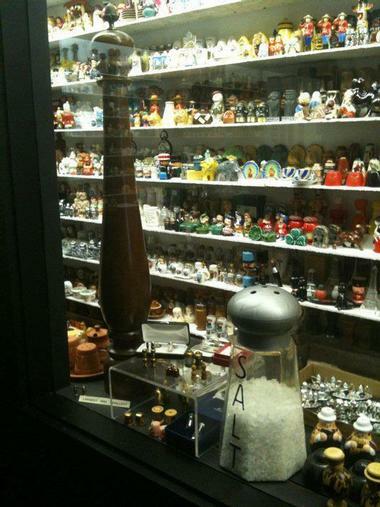 The Salt and Pepper Museum houses their 20,000 sets of shakers, and 1,500 pepper mills, and is still owned and operated by family members. The collection includes shakers from ancient times right up to the modern era, and the exhibits show how changes in society are reflected by the salt and pepper shakers of each period. It is a fascinating place to visit, and includes a gift store with over 1,000 salt and pepper shakers for sale. Sugarlands Riding Stables offers horseback riding for all levels - from beginners to advanced riders, giving them easy access to the gorgeous woodlands and mountain streams of the Great Smoky Mountains National Park. 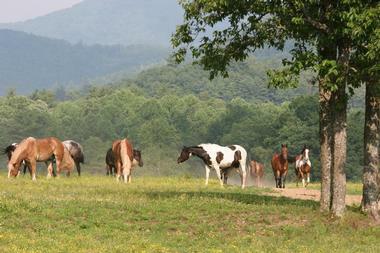 The natural terrain throughout the park means that all horseback rides are at walking pace. 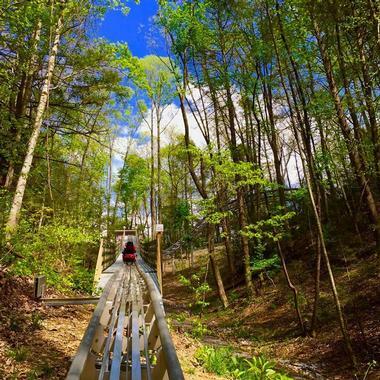 If you're geared up for adventure, the Gatlinburg Mountain Coaster may be perfect. The Coaster weaves its way through the Smoky Mountains, where you're always in control of your speed. Riders control the Coasterwith a handheld braking system and can slow down or speed up to 35 MPH on the downhill part of the rollercoaster track. You can ride alone or with someone. To ride alone, riders must be at least 56 inches tall. Children riding with adults must be at least three years old and at least 38 inches tall. The Coaster comes with lap belts and harnesses. You may pose for a picture during your ride and the Coaster has Facebook and Instagram accounts. 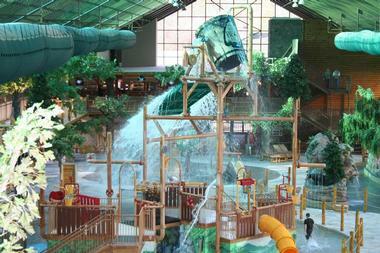 At Wild Bear Falls Indoor Waterpark at Westgate Smoky Mountain Resort & Spa guests can splash in heated water when it's freezing outside. The park features a state-of-the-art retractable roof so guests can be assured of comfortable conditions year round. Wild Bear Falls offers a great atmosphere for adults and children. There is ample time for bonding and the park boasts a safe, supervised environment so parents can relax with their children within view nearby. Lifeguards are on duty at all times. 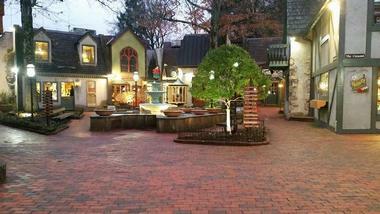 Two tours are currently offered by Gatlinburg Walking Tours. Tour schedules change weekly, so check out the business's Facebook page or call or email for current tour times. "A Taste of Gatlinburg," features six to seven stops at local eateries. Each stop offers a different food. 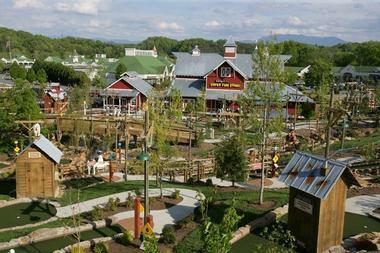 Guests come to understand Gatlinburg's history, and what characterizes this contemporary city. This tour runs up to 2 1/2 hours, and is usually offered Tuesday or Thursday afternoon. 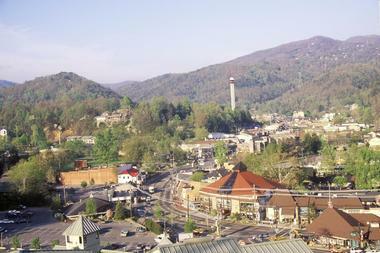 The Gatlinburg Mountain Mall is the city's premier indoor shopping experience. Situated in the center of downtown, the Gatlinburg Mountain Mall boasts an incredible range of shops - each with a custom theme. Visitors can find food, homemade candy, crafts, custom-blended tobacco products, handmade jewelry, pipes, movies, music, hot sauces, leather items, magic tricks, books, dolls, quilts, sports collectibles, original artwork, toys, and even outfits for the dogs in your life, among other unique goods. Alewine Pottery is a family-owned and operated pottery business with two locations in Gatlinburg, Tennessee. Potter Robert Alewine has studied under some of the world's finest craftsmen, and has lived and worked in Gatlinburg since 1983. Robert is joined by his son and fellow potter Mark, who shares his father's enthusiasm and skill. The Village Shops are a unique collection of stores with an old-world ambience. Designed to look like a European shopping district, the area combines decorative architecture, attractive landscaping, plenty of places to sit down, and a lovely fountain, all of which add to a serene environment. The stores are one of a kind, and focus on hand craftsmanship and good customer service. Gatlinburg locals and visitors often start their day seated outdoors with donuts and coffee from The Donut Friar. The shops include several restaurants, a silversmith, a pottery, a fine art gallery, a toy shop, and one store that sells tea and spices. One whole store sells nothing but socks; there is a Celtic shop, and a candy store where visitors can watch taffy being pulled. Located at the base of the Gatlinburg Space Needle in downtown, the Iris Theater is where Gatlinburg goes for top performers, funny shows, unforgettable performances, and importantly, big fun. Currently showing at the Iris Theater is: Impossibilities - An Evening of Magic, Mindreading and Mayhem! Master mentalist Erik Dobell and magical comedian Chris Collins have teamed up to bring guests a night of uncanny mindreading and unique magic. This is an evening of pure family entertainment where impossibilities materialize before your very eyes. The pair has traveled as far away as South Korea to present their acclaimed performances. They have been on America's Got Talent, FOX and NBC; and now they bring their wondrous show to city of Gatlinburg. Come explore the side of the city many don't know exists. Hear the tales of famous pioneers, settlers, loggers, soldiers and some regular folk who came to the city only to find misery, heartbreak, and in some cases, death. Some of these folks you will "meet" in the cemetery. This tour neither merely a history lesson nor a haunted house; no actors dressed in costumes will scare you. Instead, it is a walking tour of the city that combines history and legend and visits to the actual places where some well-known people have lived and events have happened, many with a macabre twist. There is a difference between a ghost hunt and the tour. 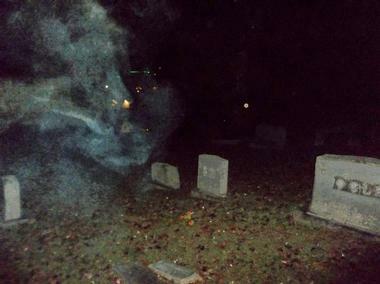 The Ghost Hunt occurs in the 200-year-old cemetery using actual ghost hunting equipment. The Tour is a walking tour of the city that ends in the cemetery, where visitors will be given 15 minutes for ghost hunting.